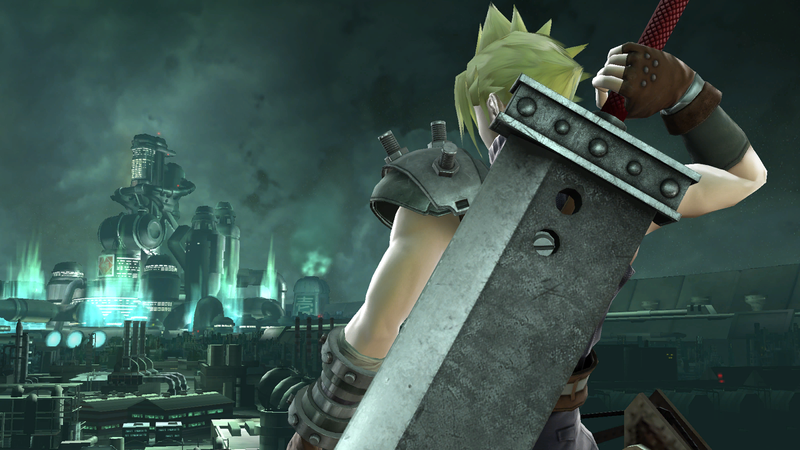 Judging by the large size of Cloud’s Buster Sword, you can imagine that just one swing of it would hurt a lot. This is exactly the case; Cloud’s smash attacks are his defining traits, and all inflict huge damage on his opponents. His forward smash, which is his strongest smash attack, hits three times in quick succession for massive amounts of damage and can greatly wear down shields. In fact, with the right amount of points allocated into his attack stat, it can even break full shields! His up smash is just as useful, as it covers a wide radius around Cloud and is a great way to catch aerial amiibo off-guard. Cloud also packs an always-helpful set of tilts and a jab, with both coming out extremely quick and having decent power to boot. 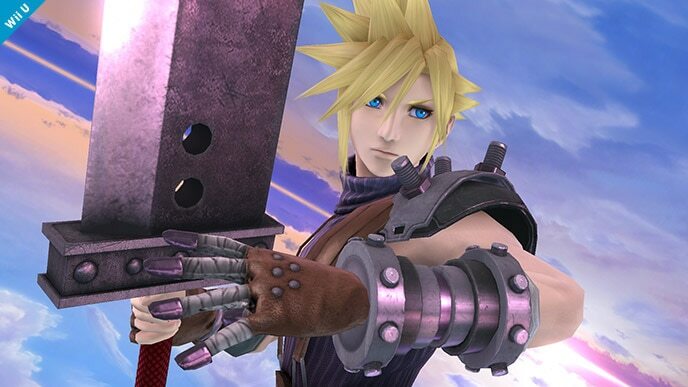 Since Cloud is a swordfighter, and thus will be fighting in close proximity to his opponent most of the time, these moves’ varied speed and power are essential to his success during combat. 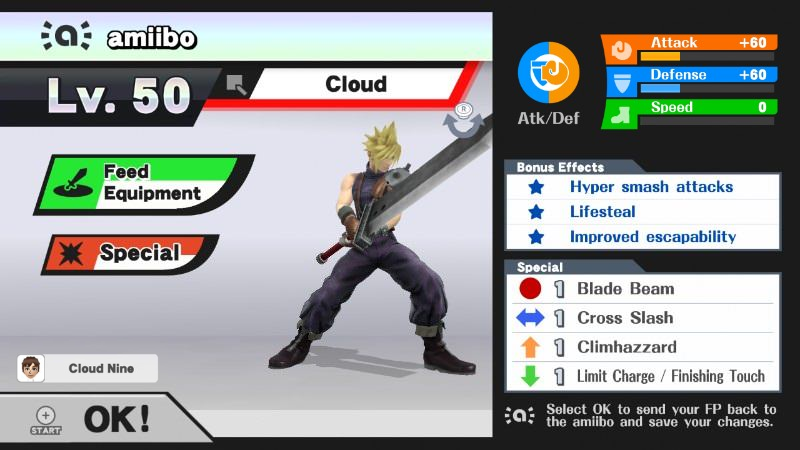 Cloud has some weaknesses that hinder or even destroy his chances of winning, with the most notable of which being his poor usage of Limit Break, Cloud’s unique trait. The amiibo can be taught to manually charge up its Limit Gauge, but has problems registering when it has reached full charge – more often than not, it’ll waste its Limit Gauge by firing the Limit Break variant of Blade Beam, his only projectile and a move that the amiibo often spams to no end. Cloud’s AI is unusually jumpy as well, and given the relative difficulty of punishing his aerial attacks, it can be hard to train him grounded at times. And though Cloud’s best attacks are undoubtedly his smash attacks, they are quite slow in startup time – his forward and up smashes may be powerful, but opponents will have the chance to easily avoid them. Cloud also has one of the worst recoveries in the game, with his non-Limit Break up special, Climhazzard, having average vertical range and even poorer horizontal range with the added hindrance of it having trouble snapping to the ledge, making him susceptible to gimps. Though Cloud has a slew of flaws that may make him a challenging amiibo to train, the payoff is worth it – you’ll have a strong tournament contender on your hands, given you prepare him with proper training. Neutral options: jab, forward tilt, and down tilt. Cloud’s jab and tilts are unarguably his best way to rack up damage quickly, with his jab coming out extremely fast and his tilts having a good mix of speed and power. For Cloud’s tilts, emphasize on his down tilt – it works almost like a dash attack and is his best move out of his fantastic arsenal of tilts. Main KO moves: forward smash, up smash, and Cross Slash (Limit Break). Cloud’s forward smash is a reliable kill move that has a high damage output and knockback, and thus should be utilized. Up smash is great for catching your amiibo if it jumps above you, and should be used just as much. And while Cloud isn’t the best at aiming his Limit Break Cross Slash, it’s a much better option for killing than his Limit Break Blade Beam. Try your best at hitting your amiibo with it. Moves to avoid: Blade Beam and Climhazzard. Cloud painfully spams Blade Beam to no end, which is a bad option since with this problem he’s more prone to wasting his Limit Break on this move. Cloud also uses his up special, Climhazzard, onstage as an attack, but more often than not he doesn’t use the second hit of it to safely land back on the ground. Avoid these two moves like the plague. Situational moves: Limit Charge. Though Limit usage is Cloud’s biggest flaw, it wouldn’t help at all to not have him manually charge it during breathers. Charge the Limit Gauge when there is a good distance between you and your amiibo. Thanks to Arklaine for compiling Cloud’s information. Images are courtesy of SmashWiki and the official Super Smash Bros. website.